In some cases you may need to impose restrictions on the drag and drop behavior. 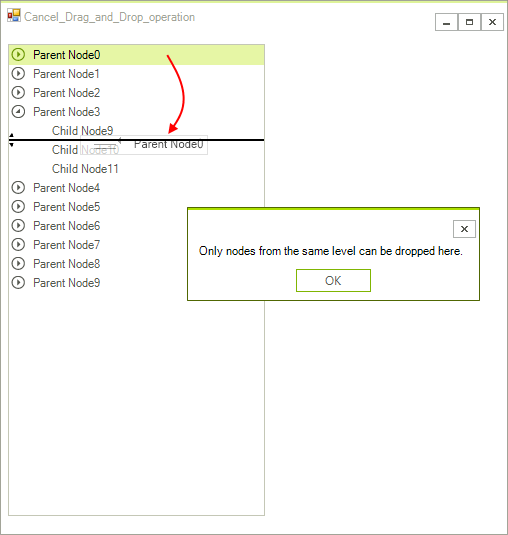 For example you may want to disallow the dropping of a node to specific location, prevent node form being dropped at different level, or perhaps disable the auto expanding of the nodes while dragging. You can interrupt a drag and drop operation by setting the AllowDrop property of a specific RadTreeNode to false. This way you still can drag this particular node, but you cannot add other nodes to it with drag and drop operation. You can set this for any particular node you want. The default behavior of RadTreeView when a node is dragged over a collapsed node is to automatically expand this node. To suppress this automatic expansion you can keep track of when a drag operation is in progress by using the DragStarted and DragEnded events. Then in the NodeExpandedChanging event handler we can cancel the expanding when drag and drop operation is in progress.